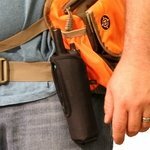 Grain Valley Garmin PRO Holster. $17.99. "This holster really saves the day." Llewellyn Setters. Hunts. Family pet. This holster really saves the day. I can locate the transmitter quickly and efficiently. It was getting old having to hold the transmitter all of the time. Thank you! "Works well in the field." Works well in the field. I think this case is much better than the one that came with the unit. The material seem to be of much tighter weave, also your customer service was great. Thanks Steve! Great product. Well made. Very handy to carry on my belt. All the buttons are very accessible. 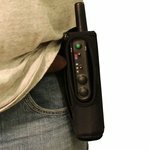 Easy to get transmitter in and out of holster. Durable quality and shoulder strap easily adjusted. It works well but I wish it had a shorter clip to fasten to my coat, I used a piece of string. "Good holster for clipping to my vest during competitions"
Good holster for clipping to my vest during competitions, and good for dog training, too! It was just a little short. Covers top button. I own a Field Pro 100 G3 by Tritronics. Description on the item listing said it works for this model. However, the top of the opening for the buttons completely cover the Top button (accessory/beeper) and half of the continuous stimulation button. Transmitter is fully seated. The opening is just too short for this model. Otherwise, it is a great product. Shoulder strap is a bit too short for my liking, so I am looking for a replacement strap. We own 9, but have anywhere from 11 to 20 dogs in our kennel on any given day. Less than a year old and falling apart. I use the the bottom loop to hook it to my side and that's were the seams are falling apart. I'm afraid I'm going to loose it soon. Is there a free replacement warranty? This does not fit my Pro 200 transmitter. The front strap covers the green tone button, and the top strap covers the top dial. I tried to modify it, but it's very clumsy to use. Also fits Tri-Tronics G3 Field and Pro models. This holster is made of durable nylon Cordura. 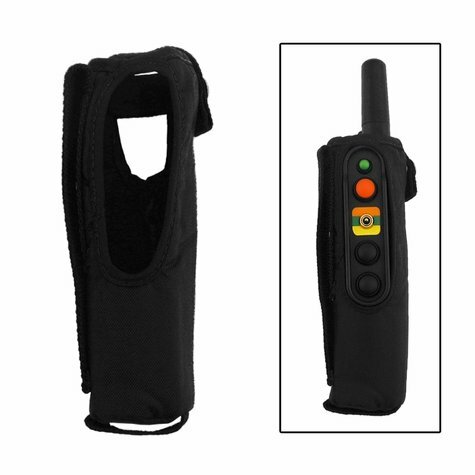 Very convenient with a hand loop and adjustable strap. Can be worn on your belt, over your shoulder, across your chest, or simply hold it in your hand. In addition to providing great protection for your Tri-Tronics transmitter, this holster also aids in assuring that you don't lose your transmitter in the field. Fits Garmin PRO 70, PRO 550, and PRO Trashbreaker.